With very similar ingredient panels, consistency, and results we think you will love to switch and save big on this product. The only difference was a slightly sour smell on the generic, but you really have to get your nose in there to notice it. The CeraVe lotion has no smell that we could detect. The store brand earned an impressive 95% similarity rating. Brandefy compares store brands (e.g., CVS Health) to name brands (e.g., CeraVe) to reveal when the generic is as good as the name brand, and to warn you when it is not. Our purpose is to help you save time and money, and to have a good time while doing it. It is no secret that startup life robs us of our sleep... and we wouldn't have it any other way. That being said, the bags under our eyes are becoming increasingly more pronounced. The Eye Repair Cream from CeraVe promises to reduce the bags, so we wanted in on the action. However, at $16.79 for a small tube, we were looking for a way to save. 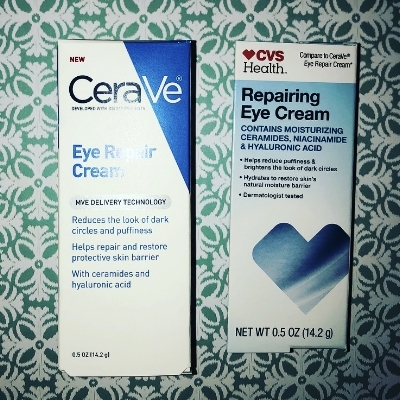 Enter: CVS Health Repairing Eye Cream. At $12.99, we like almost $4 in savings. The ingredient panels are very similar, and scored a 96% similarity score on our rating system. These two creams both felt nice under our eyes, and showed similar results over time. The only slight difference we noticed was smell. The CeraVe cream had no smell, and the CVS version had a very slight sour smell. This was not noticeable enough to matter to us. We will get the illusion of a full night of sleep, and save money, by switching to CVS Health.